A weekly international food market is coming to El Cajon Boulevard and Fairmont Avenue in City Heights this Fall. The City Heights Economic Development Collaboration will transform the empty corner lot into an open air market called Fair@44, and will collaborate with aspiring entrepreneurs to feature 10 diverse food vendors. Fair@44 will be an open air market, anticipated to operate weekly each Wednesday night starting in early October. Expect a family-friendly environment with fresh ethnically diverse food, hand-made crafts, and more, serving dishes like Jamaican jerk chicken, Japanese ramen, Cambodian curries, and Salvadorean pupusas. 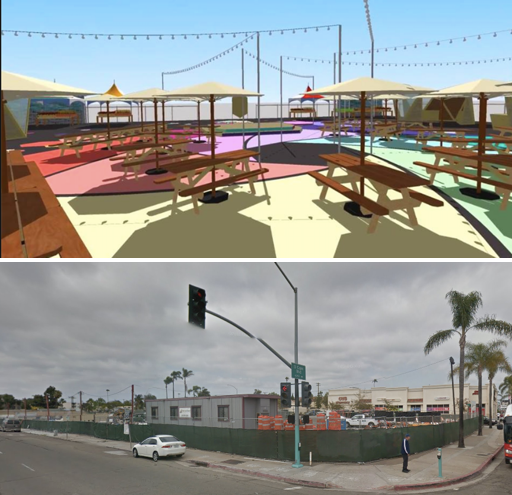 The City Heights Economic Development Collaboration will host a placemaking event today as the first steps in transforming the empty lot into a neighborhood oasis. They will start by turning the blank asphalt covered space into a colorful destination. Over the course of the following weeks leading to the market's opening, there will be several more creative placemaking events open to the community, where guests will be invited to paint, construct and create as the space is livened with art, furniture, lighting and interactive installations.